Killer in Crinolines is the second book in Duffy Brown's funny and quirky "Consignment Shop" cozy mystery series. As the month of August burns hot and humid in Savannah, Georgia, amateur sleuth and consignment-shop owner Reagan Summerside is busy gearing up her store, "The Prissy Fox," for the upcoming fall season. While visiting a wedding to quickly drop off a bow tie for the groom, Reagan stumbles upon the groom's dead body lying face-down in his wedding cake with the cake knife sticking out of his back. The number one suspect turns out to be Chantilly Parker, Reagan's close friend and the community's local UPS delivery driver. To prevent Chantilly from landing in jail permanently, Reagan and her aunt Kiki join forces in an effort to nab the killer - but not without eating their fair share of baked goodies along the way and sharing the task of teaching provocative belly-dancing classes. Reagan, however, lands herself in far more sticky situations during her sleuthing escapades - including a cockroach and rodent-ridden dumpster and in a swamp that leaves her about to be chomped on by an alligator. Also close behind on Reagan's tail is Walker Boone, the hunky and irresistible yet ruthless lawyer who once helped Reagan's ex-husband walk away with most of the assets from their union. Just as in Iced Chiffon (the first novel in Duffy Brown's series), Boone comes charmingly to Reagan's rescue several times in Killer in Crinolines to save her from a number of zany and dangerous predicaments. If you had read Iced Chiffon, then you'll absolutely LOVE Killer in Crinolines. In fact, if you weren't hooked on the series after reading Iced Chiffon, you bet your derriere you'll be hooked after reading this one. Whereas Iced Chiffon may have been a bit choppy before evening out with its pleasant story, Killer in Crinolines is seamless from beginning to end, and flows quite steadily. Not only is Killer in Crinolines far more humorous than its predecessor, but its compelling mystery and engaging plot will have you staying up countless hours into the night. 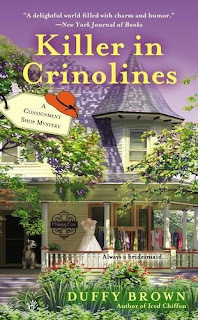 It took me only two days to read Killer in Crinolines from cover to cover, which is quite a feat given my busy schedule! Reagan's character is one of the most likable characters I've ever met in a series because she's not perfect, and this is exactly why she's awesome. She's 32 years old, doesn't have a lot to show for herself, is divorced, doesn't own a car or have any children (a fact Aunt Kiki constantly likes to remind her about), carries a tacky non-designer purse, and has crazy hair that desperately needs a color treatment. Such a familiar person is easy for readers to relate to, and this is partly why the series is destined to be a hit. I'm a sucker for cozy mysteries - especially a series such as this one with its vibrant characters and inside jokes that are carried from book to book. My favorite constants in the "Consignment Shop" series so far are Reagan's eyesore of a yellow purse (dubbed "Old Yeller") and Kiki's silly and endless quotes by Cher. Although I always dig the mystery-solving aspect in the cozy genre, I'm also a huge sucker for powerful romantic chemistry. The tension that seems to be mounting between Boone and Reagan still has me in a tizzy, and I finished the book yesterday! I love how Brown allows us readers to see the attraction Boone has for Reagan, but Reagan can't quite see it herself, or if she does, she's in complete denial. My heart gets all a-flutter during all the scenes shared by Reagan and Boone, and this is also a reason I'm now hooked on the series. I can't wait to see what transpires between the two of them! I've found that Brown's "Consignment Shop" series reminds me of a Southern version of Janet Evanovich's "Stephanie Plum" series, which are also hilarious and share the same mishaps and impending romantic side-plots. I'm genuinely excited for Duffy Brown and her very promising series, which is bound to get better and better with each new book release! I'm already enjoying the "Consignment Shop" mystery series more than Tamar Myers' "Den of Antiquity" series, which had me hooked for years and also takes place in the South. If you're a fan of Southern mysteries and just cozy mysteries in general, I HIGHLY recommend checking out this new series by Duffy Brown! You won't regret it, I promise. According to Duffy Brown's website, the third "Consignment Shop" mystery will be called Pearls and Poison, and is due out sometime in 2014. What are your favorite cozy mysteries that take place in the South? Have you read Iced Chiffon or Killer in Crinolines, and if so, what did you think? Share your thoughts with us in the comments section below! I am thrilled you enjoyed Killer in Crinolines, you made my day. Writing Reagan and Auntie KiKi and Boone is so much fun just to see what kind of trouble comes their way. And I love Savannah. The perfect city for food, charm and finding dead bodies. Thanks for all your kind words, I truly appreciate them. I loved Iced Chiffon and can't wait to read this new baby. Hi Annette! If you loved Iced Chiffon, you're definitely going to love this one even more. I'm psyched and ready for the next book in the series.